28mm Victorian Warfare: Walls come tumbling down! I've been meaning to get around to this post for a while now, but what with the spectre of the new academic year looming large, hobby time has been in rather short supply. From the outset of my foray into the world of 'Batman Miniatures Game' I was keen to build a board that set the scene for the character that I intended to play with. 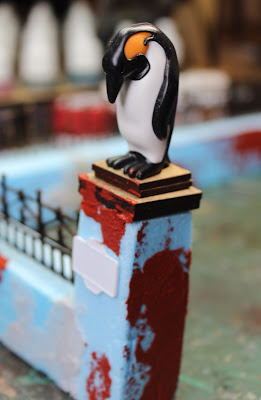 Having seen, and been inspired, by Bull's 'Funfair' for his Joker crew, I wanted a deserted zoo for my Penguin. I had some convoluted ideas for a deserted pool, half filled with stagnant water, eerily lit with LEDs, but all this came to naught, but I was desperate to have some indication of a once great attraction. So on to the build, off-cuts of blue foam were roughly hewn and the edges sanded. Using cocktail sticks to hold the structure together they were given a healthy dollop of PVA glue to bind them. Once dried a rough channel was cut across the top to insert some rather lovely laser cut railings that I had picked up from 'Fenris Games'. I understand that they are no longer going to offer this service, so if you are after some, best go and see what they have left. Any gaps were filled with lashings of pumice gel, which also helped to give a bit of texture the piece. More architectural details were added in the shape of Column tops*, signs**, and the crowning glory - a couple of Playmobil Penguins! Some red oxide paste was added to fill the gaps and again to lend texture as I was envisaging a rendered brickwork construction. **Leftover from my Tamiya lamp post kit. Finally the painting stage saw everything base coated in black, before a succession of Dulux tester pots were applied. These were the same colours that I had picked up for using on my 'Tough Terrain' piece so I was confident that both elements would hold together quite well. The railings were simply dry brushed with a little Vallejo oily steel, before given some rust effects. I had used a biro to mark some bricks behind the render and just picked these out with appropriate colours, hopefully selling the illusion of a crumbling structure. Final touches included some foliage, ivy wrapping itself around the columns, even rust stains on the render; along with touches of frippery with a 'Do Not Feed The Animals' sign, some graffiti and even a few bullet holes - Gotham has become a dangerous place for the unweary! I was surprised how quickly the piece came together and it was wonderful to see it take its place on the board. Perhaps not quite what I had envisage initially, but enough to get the idea across that this was the Penguin's home turf - Batman beware! Well neat! Self build beats ready made anyday. The post titel..a TSC song titel? Thank you Paul and spot on with the title. Being inherently lazy I do enjoy a ready made product, but there was a stirring of pride when these were completed. That looks absolutely brilliant! Great job! On a side note...Pumice Gel. What make did you use and where did you buy it? I was going to use filler but this looks much better. Thank you Gordon and the pumice gel is Vallejo and is listed as course pumice 599. I get mine from http://www.snmstuff.co.uk fabulous service and all sorts of other goodies to tempt you. I also you it for basing, dropping in a couple of larger stones that just set into the mix. Thank you, this was one of those ideas that just snowballed. Great piece of scenery, the end 'product' easily as good as commercial terrain pieces. Thank you Joe, it was hugely enjoyable to do and is a product of spending far too long scouring the internet for ideas. Awesome work on the walls etc Michael! Very well done. you gave me a wonderful idea, thanks for sharing! Thank you Luca, I'm glad it may have been of use to you. Lovely work and those penguins are just perfect! Thank you Brian, I had been desperate to find a use for them. Thank you so much Firemonkeyboy.. I am absolutely chuffed to bits with the and thank you! That's incredibly kind of you Phil, thank you. Martin that is very kind of you to say so and very gratefully received. Thank you so much Paul, I think that half the fun is trying to realise your ideas with what's available, certainly was this time anyway. Jaw-dropping work, Michael! Your terrain work is museum-quality (as your figure painting too, of course). Impressive and ingenious. What perfect statues those toy penguins made! Thank you so much Dean, wouldn't that be a great job - terrain building for a museum! Good grief man, that looks excellent!! Thank you so much Ray, very kind of you Sir. That must be one of the most ingenious use of Playmobil Penguins EVER... extremely cool terrain! Thank you so much, I had them at the start of the project thinking that they may work for the 'rocket penguins' but sadly too big. Oh, that's nice! You have a master's touch with terrain. Thank you so much AJ, very encouraging words. Thank you Simon, I think in the back of my mind I was justifying the build by suggesting that it could also be used in a post apocalyptic setting as well - zombie penguins, now there's an idea! Thank you so much Edwin. Superb work on this Michael, straight out of a film set. All the little finishing touches puts your terrain into another level. Thank you Pat, but I look to you for inspiration so to read your comments gives me a wonderful sense of achievement. Utterly splendid. you have a real eye for the detail and the whole piece hangs together wonderfully. the render with brick under, the little signs and penguins themselves on the pillars. Great, great, great. I love the railing too. Very well done sir! Thank you so much Sir, hugely enjoyable to do and inspired by your own themed build. Should be great fun see the Joker crew running around here. Holy Scratchbuild Batman, that's brilliant! You're going to wind up with a real show-piece of a table when you're done. And you and the Templar might want to consider taking your game to a Convention where there are awards for best figures, best game, best table etc. This stuff needs to be seen at a Con and I hope one day you do it. Thank you so much Anne and who knows maybe one day. I have been very lucky to have been encouraged to play by a couple of very enthusiastic chaps. Wow wow wow you have absolutely got this terrain spot on! The cocktail stick tip is pure genius....thanks for sharing this. Thank you and not a problem, I would have undoubtedly seen the idea somewhere else first so thrilled to have passed it on. Will you stop it? Can't you just do something that looks 'okay' for once? Enough with the awesomeness! Thank you Kieron, I am quite humbled by your comment. Thank you Terry, I hope that it might be of interest to someone, certainly great fun to build. Fabulous, atmospheric work. Can't wait to see the whole board. Thank you Herbert, running out of summer holiday! An awesome piece of terrain, my friend! The idea to combine those materials was excellent and the result simply perfect. Especially the idea with the Playmobil penguins. Really wonderful! Thank you so much Stefan, the penguins were hugely rewarding as I had originally bought them with another idea in mind - pleased that they didn't go to waste. Holy zoological gardens! Break out the penguin repellent Batspray! :D Thank you Tamsin, let's not give the Caped Crusader any ideas though. I am gobsmacked by the care and detail that went into this project, amazing work! I think I'm going to have to get some of that pumice stuff, and the MDF detail really works. There's even a gazebo, for those D&D players old enough to remember! Thank you Ev, that pumice gel is very versatile, I use it for basing miniatures as well. Top drawer Sir - as always. Thank you so much Dan. Cracking terrain mate. I'm always happier when I build my own and yours illustrates why - packed with character and detail and an absolute one-off. Keep it coming! Thank you Millsy, I must admit trying and work out ideas like this is a hugely rewarding part of the hobby for me. Superb work Sir Michael! Unique and very fitting. Thank you so much Bob and ready for zombie games too. Great work on the walls and gate! Thank you very much Cyrus. Ever since I saw your batrep using this terrain, having identified the majority of the components, I did wonder about the zoo walls. Genius idea using the Playmobil penguins! Should you require fencing/railings for future projects, check 'model railway fencing' on ebay. Both pre moulded plastic and laser cut MDF available in a variety of styles and sizes. Ignore the scale, read the description as this usually gives the height and will indicate whether it's suitable. Excellent work, Mr Awdry. Consider your ideas stolen. Thank you Jez and great idea with the model railway fencing. I was originally after some taller fencing for abandoned animal cages so will definitely have a search around. As for the idea, please help yourself, I'm sure it came about from trawling the internet for inspiration. That, Sir, is a genius idea! Jez, I know that I have asked this before, but are you contributing to a current blog? Indeed I am. My humble efforts in the area of wargaming can be found here -https://carrioncrowsbuffet.wordpress.com/ where you will find superheroes, Masters of the Universe and, currently, oriental fantasy. Feel free to pay a visit! Excellent, off to have a good look round. Brilliant attention to detail and wonderful looking results. Exellent tutorial! stunning work Michael! That's simply stunning Michael! Your Batman board will be a spectacular eye catcher once fully done.